Outsourcing web development is one of possible solutions while building a website or web application. Whether you can’t afford hiring your own team or don’t want to do it yet, it gives you an access to experienced developers. Outsourcing may be beneficial to you regardless of your business’ size. Whether you are a solo founder, a small business owner or a CEO of a large company, the main advantages of outsourcing are almost the same. The good news is: you’re not alone. There are many Quora threads asking the same question: whether to outsource the work or hire an in-house team. In this post I want to show you the advantages of outsourcing web development over building your own team of developers. Outsourcing web development may pay off in many ways, including cutting the costs, reducing the time-to-market or making it easier to access top IT specialists. Now, based on the experience we’ve gained helping our clients bring their projects into life, I’ve put together this list of advantages of web development outsourcing. From startups to corporations, every project has its budget. And the budgets have limits. Outsourcing is a good idea, if you need to cut some expenses to reach your business goals. First, the differences in hourly rates of developers in various locations can be significant. For example, you can pay $150 per hour in the U.S., while for the same job in Eastern Europe you’d pay only $35-$50 per hour. And that’s without losses on the quality. Did you know that Polish developers are among the best ones in the world? 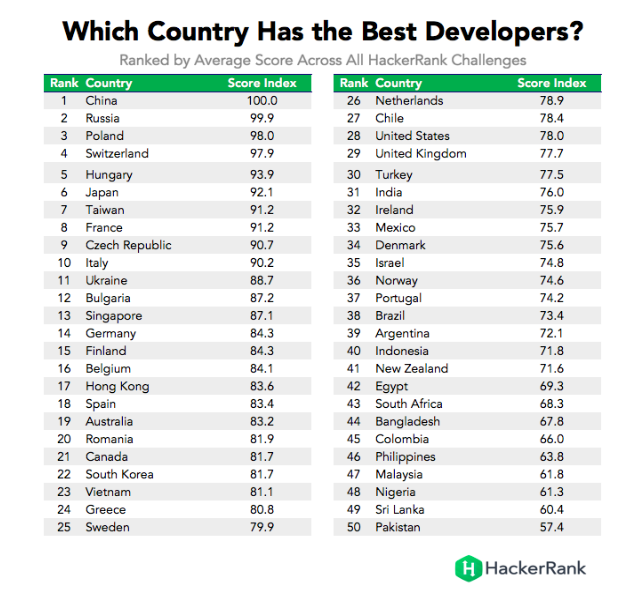 According to HackerRank, they are now number 3 globally, right after the programmers from China and Russia. With an outsourced team, all you pay for is the time spent developing your project. It’s especially crucial if you’re just starting an online business, when every penny matters. Outsourcing helps you to keep the burn rate under control. Outsourcing gives you the access to programmers, UX/UI designers, project managers and creatives worldwide, that can contribute to your project’s success. To build a team like that, you’d need to dedicate lots of time and money to recruit the right people, onboard them and create an actual team out of the individuals who had never worked together before. According to Glassdoor, it may take up to 48 days to recruit IT specialists, and the average length of recruitment processes around the world is trending up. By experience I don’t mean just the programmer’s seniority level. It’s how the team works together, based on the projects they’ve done in the past. It’s also the experience in developing IT projects – knowing what works and what doesn’t Building software is not only about knowing how to code it, but also understanding how to manage the process. Outsourcing web development, you hire not only developers, but also project managers experienced in managing software development. It’s easier to scale your project with remote team of developers. Starting off, you may want to develop an MVP of your web application, then to collect feedback and scale or pivot. For example, at the beginning of the development, when lot’s of work is being done, you may need designers, developers and project managers, while during the maintenance you need just a couple of programmers. Then, if you’d need to pivot, more manpower is needed again. If you were to develop the product in-house, it would be harder to adjust the manpower to work capacity. Programming these days relies on the vast number of technologies, frameworks or libraries. And one doesn’t have to know them all to be a good frontend or backend developer. Outsourcing gives you the access to all kinds of specialists, who are experts in their field. Whether you’re looking for a PHP or Python developer, or a frontend one experienced in React-based projects, it’s much easier (and quicker) to hire them as an outsourced, remote team. Time is very often one of the crucial factors when developing a project. Either you plan to build new software or redo the existing one, a strict timeline is something that you have to take into account. With outsourcing you save time on recruiting and onboarding programmers. It all cuts the overall time you’d need to develop your website, including the time-to-market. If you follow these 5 steps to safe web development outsourcing, you can successfully reduce the risks bounded to working with remote team. Choosing a company with good organisational and communication standards, you’ll be updated every step of the way. Moreover, hiring a remote team you’ll be working with project managers experienced in developing many projects. This cuts the risks of developing a website, too. An experienced tech partner can not only be your software vendor. You can use their experience in product development to evaluate your idea, too. 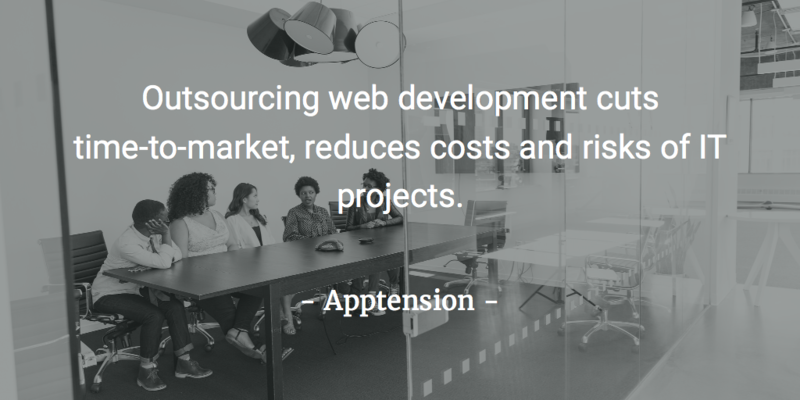 At Apptension, we offer kick-off workshops during which you and our team focus on understanding the project with its goals and business objectives in mind. We can then map user flows and suggest how to translate everything into a user interface, test assumptions and hypotheses, validate them and prototype how the product may look like. In the end, we’re able to come up with a product that fits your idea and answers your audience’s needs. Since you may not have a steady income yet, as you’re just trying to build your product, these costs will make a toll on your burn rate. Outsourcing, on the other hand, allows you to control your spendings, as you pay only for team members you need at the moment. Software development, if done in-house, will most likely consume a lot of your attention. It’s a process that has to be carefully monitored. Outsourcing your software development to a team of experienced programmers, QA specialists and project managers, you can focus on core business processes, you might have neglected otherwise. This way, when your product is finally developed, you’re better prepared for the launch and running sales and marketing campaigns. At Apptension, we’re experienced in working for clients ranging from startups to digital production studios. We know what it takes to deliver great software. We have also developed our own SaaS tool, Teamdeck. If you care about the quality of code, want to have full control over the project, communicate frequently or even to visit us at our office – estimate your project with us. Together, we can make your project happen. If you want to start an online business there are various things you need to consider. Learn how to start an online business with these actionable tips.